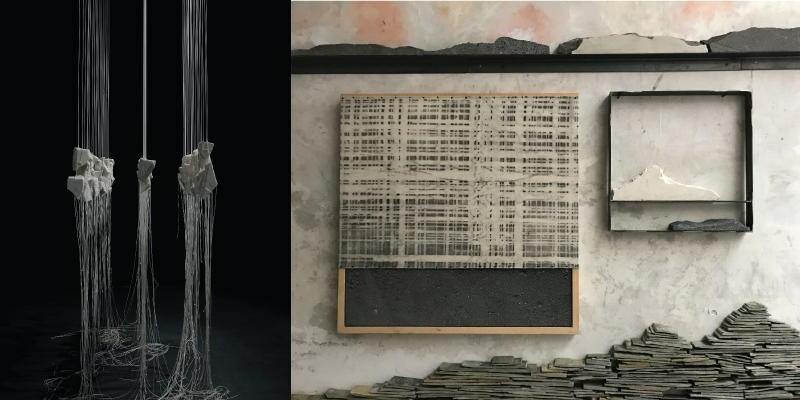 The Mexican Cultural Institute is proud to announce the opening of its next exhibit, A Dark and Scandalous Rockfall, (Una oscura y escandalosa caída de piedras), a collaborative installation by Perla Krauze and Barbara Liotta, artists from both sides of the Mexico-United States border. A site specific exhibit, A Dark and Scandalous Rockfall was organized by independent curator Laura Roulet. The title of the exhibit is drawn from the poem “Dry Rain” by Mexican poet Pedro Serrano, which begins: “At times the poem is a collapse/ a slow and painful landslide/ a dark and scandalous rockfall.” Given the current state of U.S.-Mexico relations, this exhibition presents a healing gesture, recognizing our shared history. Both artists use the material and metaphorical qualities of stone to evoke landscape and classical sculpture. First stacked to form cairns, walls, and shelters, then carved to create figures, stone is an ancient, primary material. Krauze and Liotta use the embedded meaning of natural stone – where it came from, its form, color and texture, what it is used for – to enhance their stacked and suspended sculptures.